In response to a sangha member’s query on irrigation practices at Green Gulch Farm, Farm Manager Qayyum Johnson shared these reflections on the complex set of issues that must be carefully considered as Zen Center continues to operate a farm during this time of drought. Water is a precious commodity, of course, and we are keenly aware of this at Green Gulch (as are all farmers whose entire livelihood depends on the availability of it). We farm in a particular watershed, with particular crops (cool weather, water-hungry) and a particular farming system that relies on overhead watering. 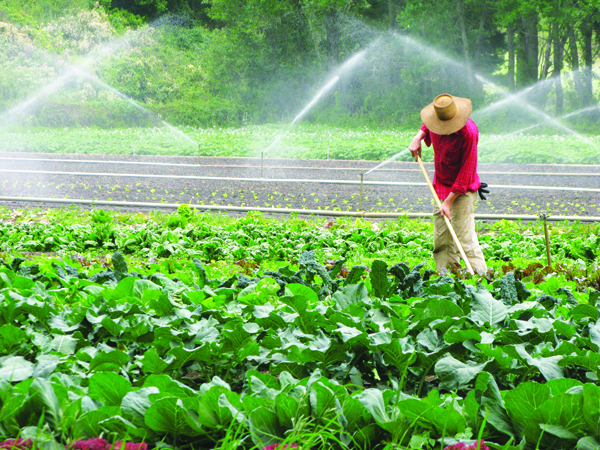 About one-quarter of our crops use micro-irrigation (“drip”). One of the consequences of drip is that the petroleum-based emitter tape breaks down quickly (we get only one to two seasons out of new drip tape) and creates a pile of waste product that then needs to be down-cycled. It’s another conundrum to get it to a recycler, since we are so small and relatively remote that it doesn’t “pay” for a recycler to make a trip out here for our drip until we have a pile that can half-fill a tractor trailer truck. In the meantime, it sits in a growing mound under our treeline�a testament to our reliance on plastic and the oil-industry from which it comes. There is also the practical reality that some crops don’t do well on drip irrigation, as well as the fact that moving micro-irrigation tape on the scale we’re farming presents a labor challenge: we don’t have enough people to unroll, roll, repair and roll-up again those thousands of feet of drip tape. Not impossible; it just hasn’t been done here before. Overhead irrigation, on the other hand, is done with solid pipes that have been used for decades. We do certainly lose a portion of water to the near-constant east-blowing winds off the Pacific, but it lands in the watershed, filters through the ground & rejoins the creek that provides riparian habitat for all sorts of life. I am working very hard to fine-tune our irrigation to avoid over-watering and ideally try to water when the wind isn’t blowing and the water has the best chance of landing where we want it to before dispersing through drift or evaporation. All our irrigation water is sourced from winter rains and stored in reservoirs that were built by the previous landowner. We use no well water to irrigate. With the drought, we’re acutely attuned to the fact that when our reservoirs are empty, we can no longer farm, so I’m doing my best to shepherd this vital resource in the most responsible manner possible. As with any topic, there are innumerable inroads and perspectives to take on the matter: should we be farming and growing food at all? is one of them. Another is who we market to�should we be growing staple food crops and providing them only to low-income residents of the local region who lack access to organic veggies, instead of at farmers markets and to restaurants and grocery stores (whose purchase of produce pays for the continued operation of the farm)? 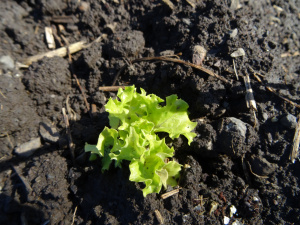 Is water-hungry lettuce a staple food crop? You can see that this conversation is connected, like Indra’s web, to many, many important issues: food justice, ecological land stewardship, how the commons (land and water) and our collective resources are divided up. And that complicated conversation is taking place within the context of human-caused climate change that promises that all the old weather patterns and seasonal rhythms will be undergoing significant and difficult changes for the rest of our lives. I’m very happy to turn these questions together with anyone who’s interested. We need as many critically engaged minds on all these issues as possible, as we work toward creating resiliency and an equitable, non-polluting food system. Folks can get in touch with me at farm@sfzc.org or call 415-354-0420 with input or questions.